First published in 1892, "The Yellow Wallpaper" is written as the secret journal of a woman who, failing to relish the joys of marriage and motherhood, is sentenced to a country rest cure. Though she longs to write, her husband and doctor forbid it, prescribing instead complete passivity. In the involuntary confinement of her bedroom, the hero creates a reality of her own beyond the hypnotic pattern of the faded yellow wallpaper--a pattern that has come to symbolize her own imprisonment. Narrated with superb psychological and dramatic precision, "The Yellow Wallpaper" stands out not only for the imaginative authenticity with which it depicts one woman’s descent into insanity, but also for the power of its testimony to the importance of freedom and self-empowerment for women. This short story follows a woman's descent into madness as she is prescribed a 'rest cure' which consists of doing nothing in order to reach full health again. She is left alone for most of her days and she begins to develop an unhealthy interest in the yellow wallpaper surrounding her bedroom. I really enjoyed this story. I found it to be rather ambiguous which really helped portray a character who was going mad. The first person narrative really aided this because we as readers are able to see how she feels and what it's like in her head. This creates an gap between the readers who are sane and can tell the difference between reality and the hallucinations of the protagonist, however there are even some scenes that could be seen as difficult to distinguish. This highlights the incredibility of the writing style! Due to the ambiguity, it allowed for many different analyses to be created which is something I enjoyed thinking about. 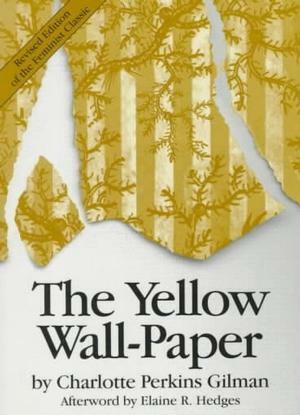 I liked discovering what the yellow in the wallpaper signified to the reader and how the hallucinations could represent society of this time period. As a literature student I found this fascinating! The story line was really intriguing, however I didn't realise how short this story would be! I felt like it had a rather abrupt ending, which I wasn't really prepared for. I would have liked to read more about her final connection with madness yet this was still a thought provoking finale. I felt that the messages in this story were really prominent and important. I loved how the author was a feminist during a time when women were had such little opportunities and she really sparked the movement by writing such an unusual novel in this time, where it wasn't really accepted. Overall I loved this book and would definitely recommend it! Due to the shortness of the novel I read it in less then an hour but spent the rest of the day thinking about all the hidden meaning and clear messages throughout! It is dull enough to confuse the eye in following, pronounced enough to constantly irritate and provoke study, and when you follow the lame uncertain curves for a little distance they suddenly commit suicide--plunge off at outrageous angles, destroy themselves in unheard of contradictions.